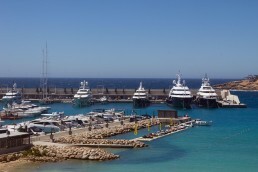 Port Adriano was designed by Philippe Starck and is located in South West Mallorca. The Marina has sold the majority of the moorings and this 45m Berth is now the best priced mooring on the Market. With a 12m beam this Berth can accommodate a Range of Boats. Each year Mallorca becomes more popular this mooring provides a great opportunity to store your Boat in Mallorca for a good price. The mooring is located in the Private Superyacht section with gated access for privacy and the full range of Marina services expected from one of the top Marinas in the Mediterranean. The 45m Mooring / Berth Offer provides great value, Marlin Marine have studied the Berth & Mooring market and this Mooring is the best valued Mooring & Berth on the Marina Market in Mallorca for a Super yacht over 45m. Port Adriano is located in South West Mallorca. Designed by Philippe Starck this Marina houses Superyachts up to 90m. Mallorca is also one of the most sought after Harbour locations in the Mediterranean. Mallorca has a strong backing of proficient marine professionals to support your yacht. Providing ease of access to major cruising destinations including the Cote De Azure, Southern Spain many Superyacht owners decide to base their yacht in Mallorca for the accessibility, Support and pure beauty of Mallorca.